If you are lucky enough to have willows, poplars, elms or cherry trees in your yard, you already have a favorable environment to attract orioles. If you don’t, however, there are still several simple ways to attract orioles to your garden. Oriole sipping nectar from an orange oriole feeder. Orioles feed on insects and caterpillars, but also like nuts, suet, and fruit such as oranges, cherries, apples, pears or bananas. As well as offering oriole nectar from the recipe shown below, consider offering chopped fruit on a feeding platform or nailing half an orange to a tree – simply hammer in the nail, then force the nail through the skin of the orange. You can also slice oranges and suspend them from tree branches from string, twine or hooks. The orioles will love them! 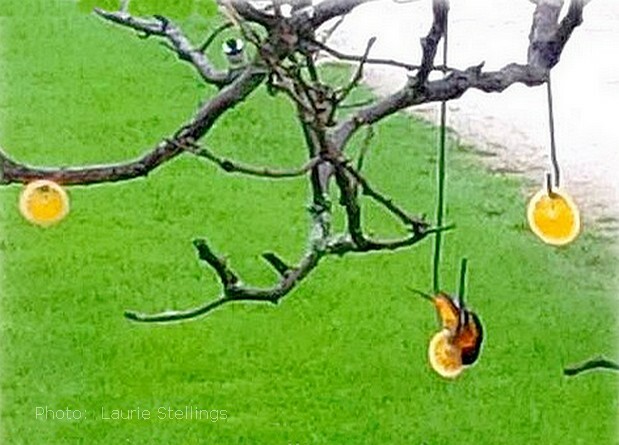 Baltimore Oriole eating orange slices suspended from tree branches. Keep things fresh and mold-free by replacing the fruit daily. 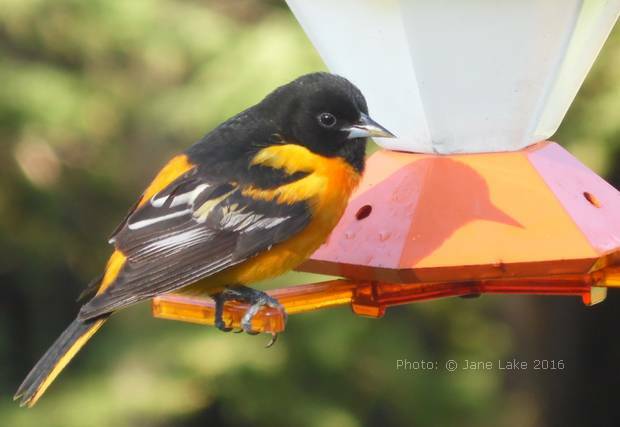 Oriole feeders are similar to hummingbird feeders, but are colored orange, rather than red, with larger feeding holes to accommodate the larger size of the birds. Encourage nesting orioles by offering various nesting materials. Good choices include cat or dog fur, natural fiber dryer lint, or short pieces (3-4 inches) of natural fiber twine and yarn. These enticing home additions can be tucked into tree branches, spread over bushes, or packed into wire suet cages for ready pick-up by the birds. Although commercial oriole food is usually orange colored, do not add food coloring, honey (which ferments), or artificial sweetener to your homemade recipe. 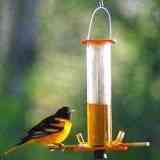 You should clean your feeder every few days, with hot water and a mild (10%) bleach solution to inhibit mold. Rinse thoroughly before refilling with your homemade nectar. Can I use coconut sugar for the mixture? This question came up about the recipe for Hummingbird Food. The answer then was that coconut sugar contains iron, which would be bad for the little birds. I’m not sure about orioles, but I wouldn’t chance it. I would also suggest using organic sugar and filtered or spring water. Orioles don’t need to be subject to GMO’s or chlorine or fluoride.